The right to health, having been previously neglected is now being deployed more and more often in litigation, activism and policy-making across the world. International bodies such as the WHO, UNAIDS, World Bank and WTO are increasingly using or being evaluated with reference to health rights, and international NGOs frequently use the language of rights in campaigning and in more concrete litigation. This book brings together an impressive array of internationally renowned scholars in the areas of law, philosophy and health policy to critically interrogate the development of rights based approaches to health. The volume integrates discussion of the right to health at a theoretical level in law and ethics, with the difficult substantive issues where the right is relevant, and with emerging systems of global health governance. 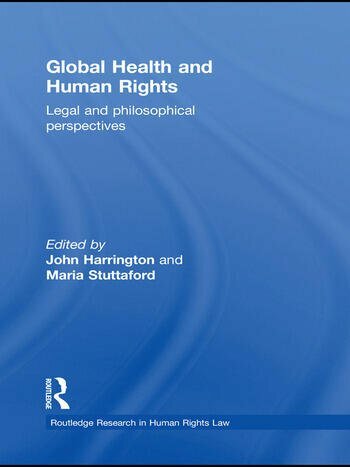 The contributions to this volume will add to our theoretical and practical understanding of rights based approaches to health. John Harrington is Professor of Law at the University of Liverpool, UK. Maria Stuttaford is a Senior Research Fellow at the Institute of Health at the University of Warwick, UK.